Holy double rainbow! Our Fall Fashion issue is a doozy. South African gun songs with Spoek Mathambo, New York bed and breakfast with Glasser, stylish Colombia, teenage Mexican raves, parenthood with The Walkmen. We can list forever, page by page, all we have crammed into one of our favorite issues of The FADER but we don't have to because you can see for yourself. 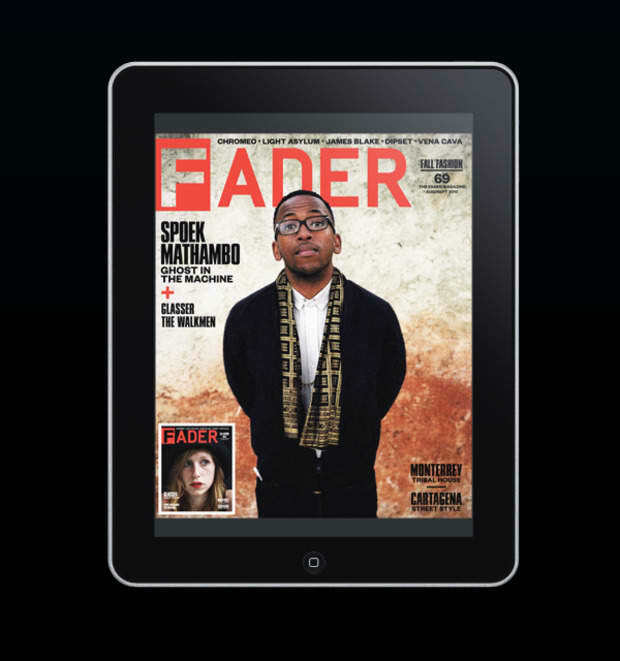 Starting with this current issue, digital copies of The FADER on your computer or iPad will be for sale through Zinio, with a yearly subscription running you the bottom dollar amount of $16.99 aka 43% off the cover price. And for those of you who are just as in love with the audio podcasts that accompany every issue of The FADER, you can still find those over on iTunes. Check out Zinio for more details and enjoy the fall in style.